The VIVAMAYR health center Maria Wörth is the birthplace of modern Mayr medicine. 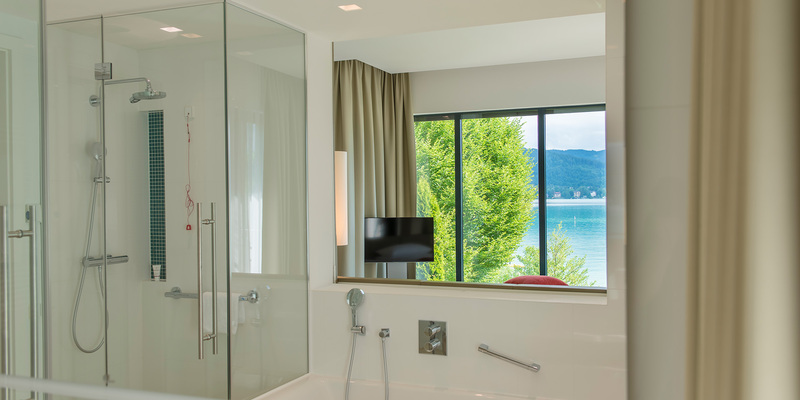 Under the renowned guidance of Prof. Dr. Harald Stossier, guests find tranquility and new vitality on the picturesque peninsula of Lake Wörthersee. This place of relaxation invites you to absorb the life-empowering VIVAMAYR philosophy in an idyllic environment. The standard room is approximately 28 m² in size, for single use only with a living room, bathroom, balcony, sofa or lounge chair, tea bar and TV / DVD player and interactive broadcast system. The comfort room with or without lake view is approximately 35 m² with living and sleeping quarters, bathroom, balcony, sofa and/or lounge chair, a tea bar and TV / DVD player and an interactive broadcast system. 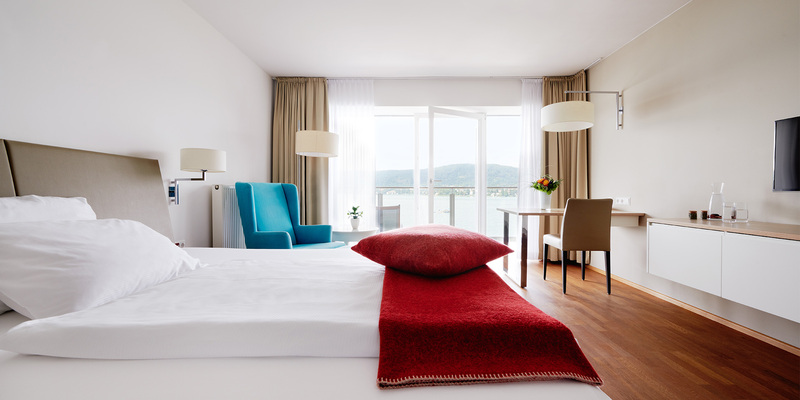 The deluxe room is approximately 45 m² and features a balcony with lake view and living/sleeping quarters, bathroom, sofa and/or lounge chair, a tea bar, TV / DVD player and an interactive broadcast system. 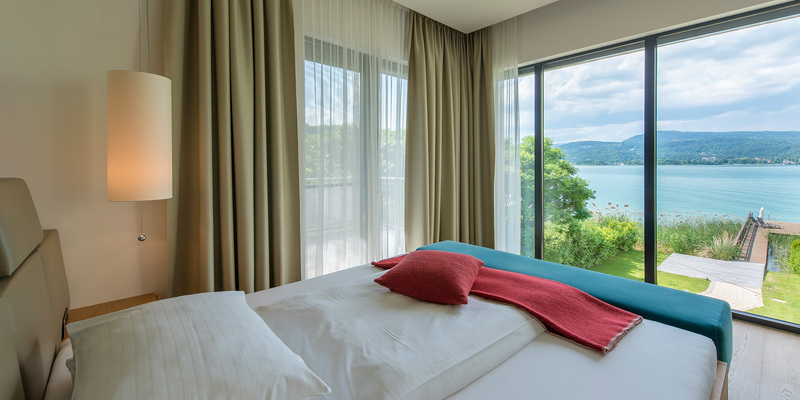 The 65 m² Junior Suite has a lake-view balcony, bedroom and living area, bathroom, sofa and/or lounge chair, a tea bar, TV / DVD player and an interactive broadcasting system. The suite measures approximately 110 m² and has two sleeping areas, two bathrooms, a living room with two balconies and lake views, a sofa and/or lounge chair, a tea bar and TV / DVD player with an interactive broadcast system, located on the top floor. The ground floor apartment measures approximately 107 m² and has a bedroom, a bathroom, a separate toilet, a living room, an infrared armchair, a tea bar, TV / DVD player and interactive broadcasting system, a large terrace with sitting area, private garden and dock with sun loungers and umbrella. There is also a private parking space and a separate entrance. The upstairs apartment is about 80 square meters and has a bedroom, a living room (this can also be used as a bedroom for another single person), two bathrooms, a tea bar, TV and a large terrace with full direct lake view. The villa has a total area of approx. 187m². The ground floor is approximately 107 m² and has a bedroom, a bathroom, a separate toilet, living room, an infrared armchair, a tea bar, TV / DVD player with an interactive Broadcastsystem, a large terrace with seating area, private garden and jetty with sun loungers beds and umbrella. There is also a private parking space and a separate entrance. The approximately 80 square meter floor has a bedroom, a living room (this can also be used as a bedroom for another individual), two bathrooms, a tea bar, TV / DVD player with an interactive broadcast system and a large terrace with a full lake view. The extensive medical treatments in Maria Wörth are designed to inspire you. In addition to our analysis and consultations using state-of-the-art equipment, the range extends to ion and laser therapies. Beauty and health are one and the same. To maintain a youthful look, it is important to have a well-functioning digestive system. Our skin is the largest organ and a mirror of true health and requires nourishing body care. As an enhancement to Modern Mayr Medicine, VIVAMAYR Cosmetics includes a range of individual cosmetic treatments that support and complement our medical therapy programme. The Maria Wörth Medical Center offers plenty of cultural and outdoor activities with beautiful golf courses and outdoor sports like rowing, swimming, skiing, ski touring, water skiing, Nordic walking, and cycling.